Does everyone know that I just adore mexican food by now?? Yes, we eat this Latin culture’s goodies at least thrice weekly. Salivating now. Set your oven to broil and line a baking sheet with foil. 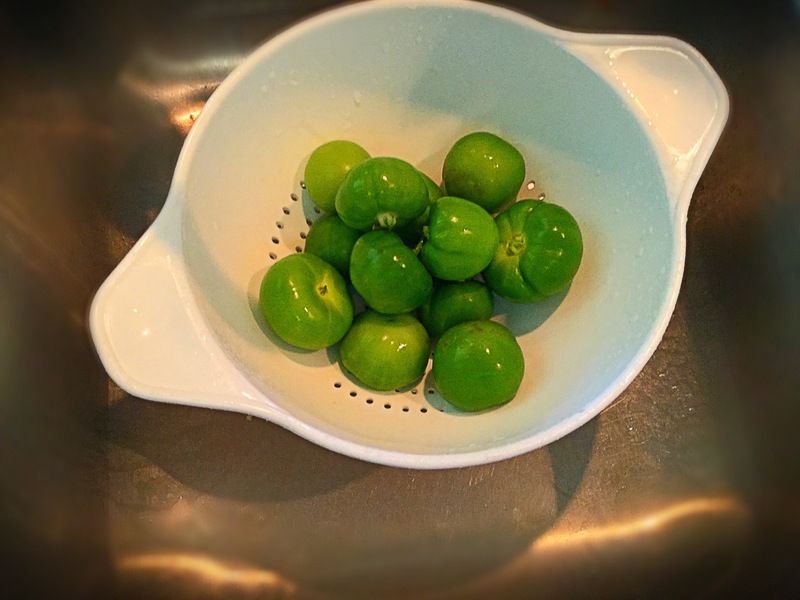 Cut each husked tomatillo in half horizontally. Lay these cut-side DOWN onto the sheet, along with the poblanos, jalapeños and 5 of the garlic cloves (leave the skin ON the garlic here). When peppers are good and done, place in a paper lunch sack and close. 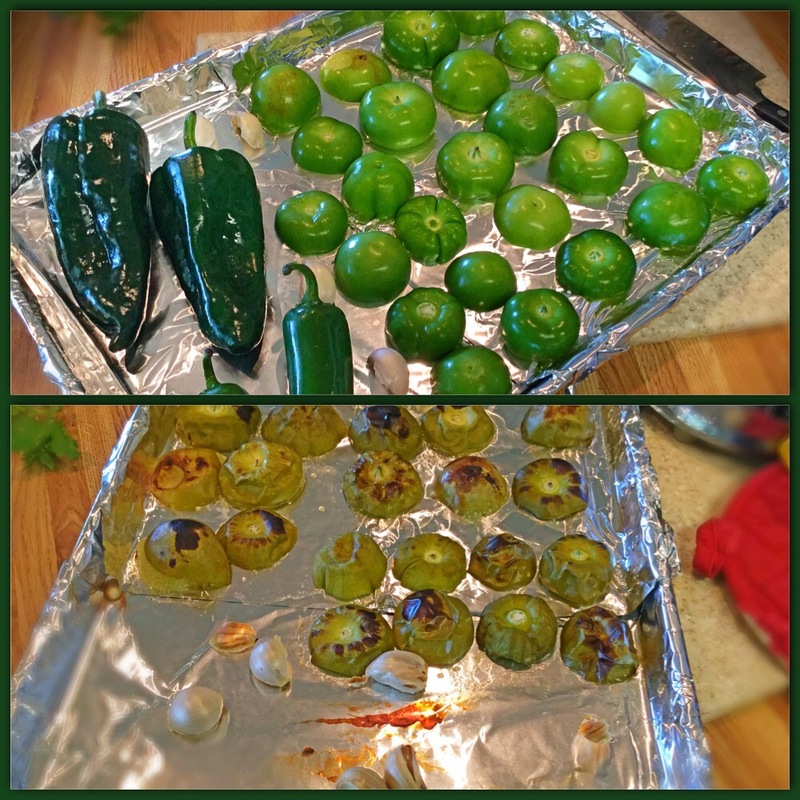 Allows to steam in bag for 10 minutes, while tomatillos finish broiling. 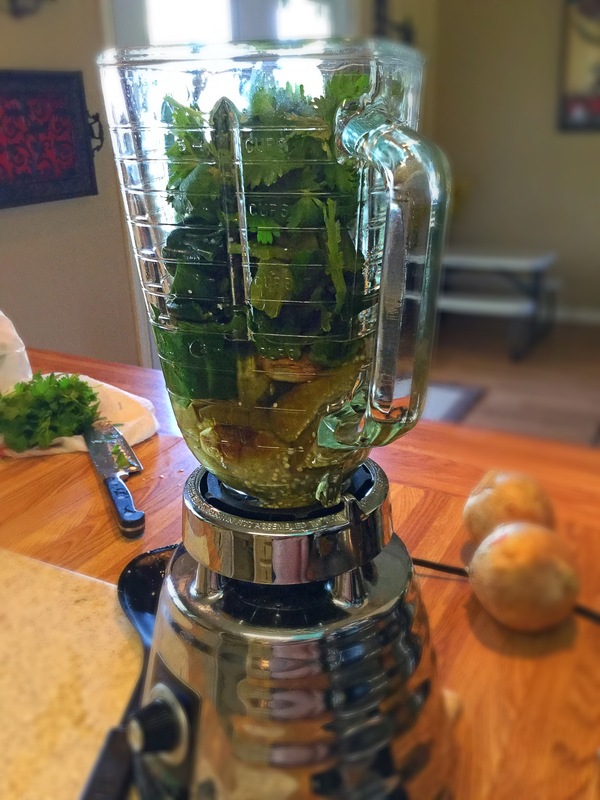 Onto the blender! Add in the roasted tomatillos (skin and all), cilantro, roasted garlic (squeeze out of the papery skin), the roasted and steamed peppers (waxy skin removed), 1 tsp cumin and 1 tsp salt. Blend!! 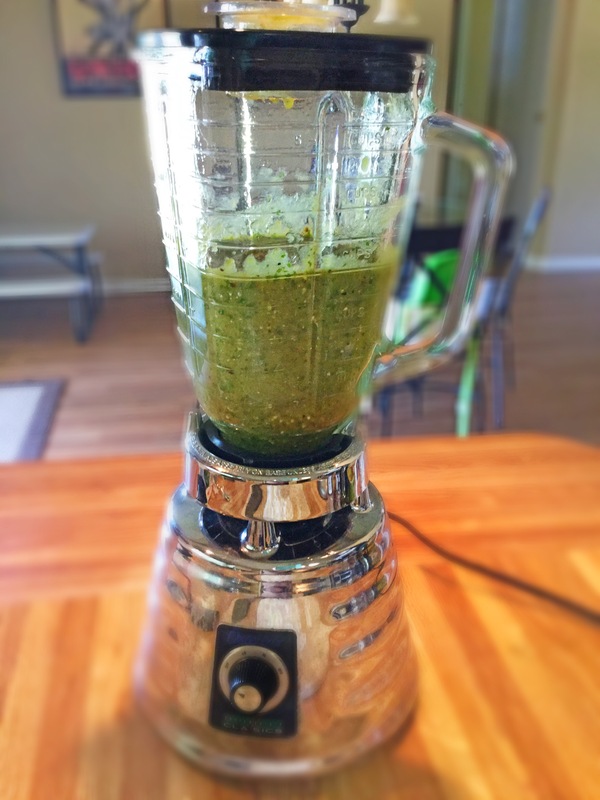 Your verde sauce is now complete! Easy right??! We’ll keep this in the blender and set aside. 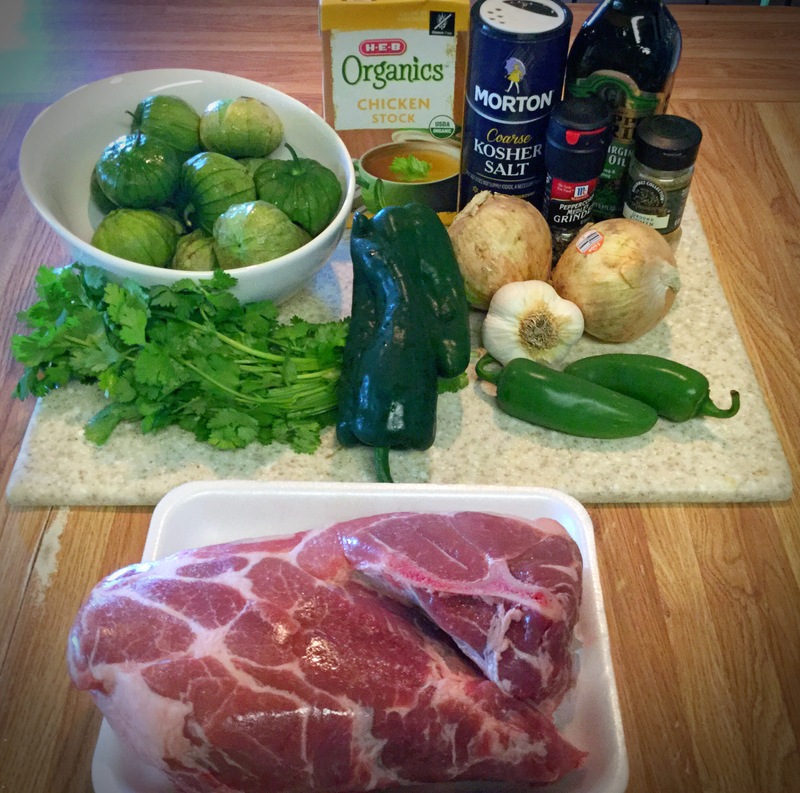 Ok, pork prepping time. 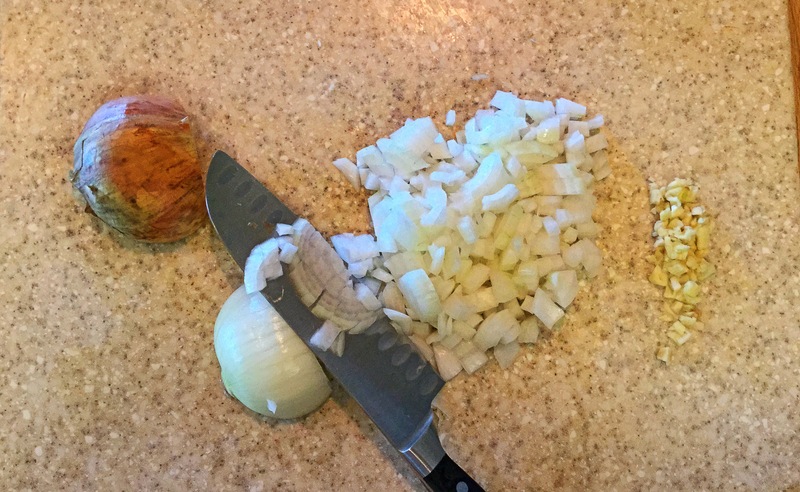 Chop up the two onions and mince the remaining 3 cloves garlic. 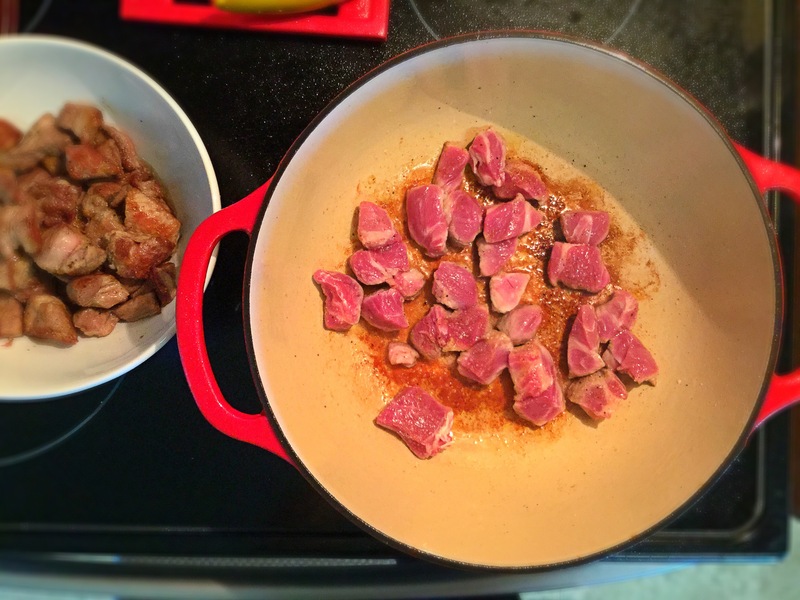 With a sharp knife, carefully cut the pork into rough 1″x1″ cubes. Season liberally with kosher salt & pepper and a bit of cumin. Heat a large heavy bottomed pot with 2 Tbsp’s of EVOO to med-high heat. Once hot, add in the pork (about 1/4 at a time, do not overcrowd). Sear the pieces on each side for 1 minute and set aside. 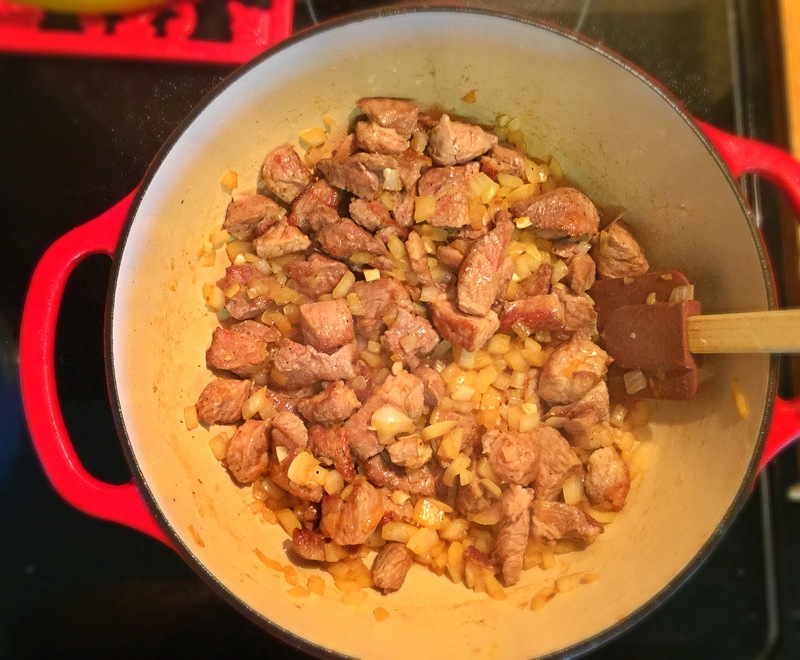 Once the pork is finished searing, add the onion to that same pot. As it starts “sweating” and releasing its juices, scrape up to those delicious brown bits from the bottom of your pan. *please use the proper utensils to not scratch your cookware. 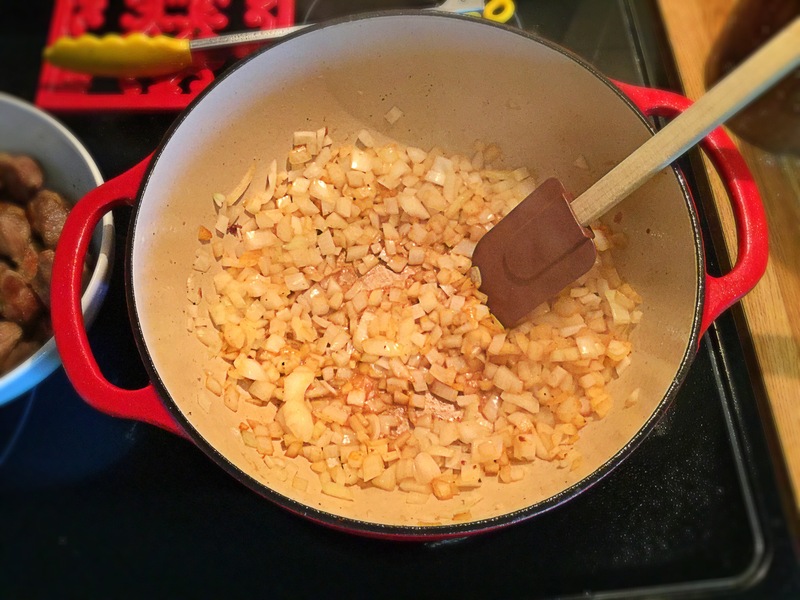 Toss the seared pork back into the onion filled pot along with the minced garlic. Ok, we’re almost ready to walk away for a few hours…just a couple more steps! 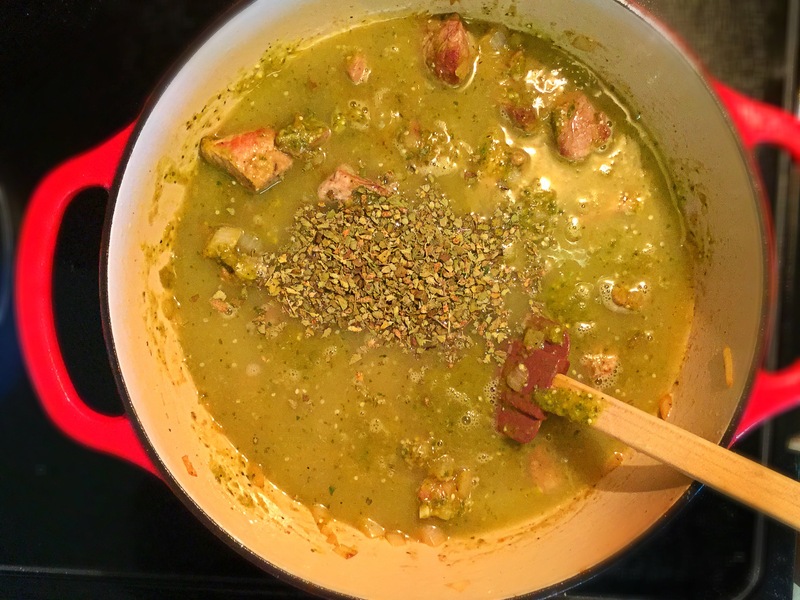 Pour in the verde sauce you made just minutes ago…looking and smelling good, isn’t it?? 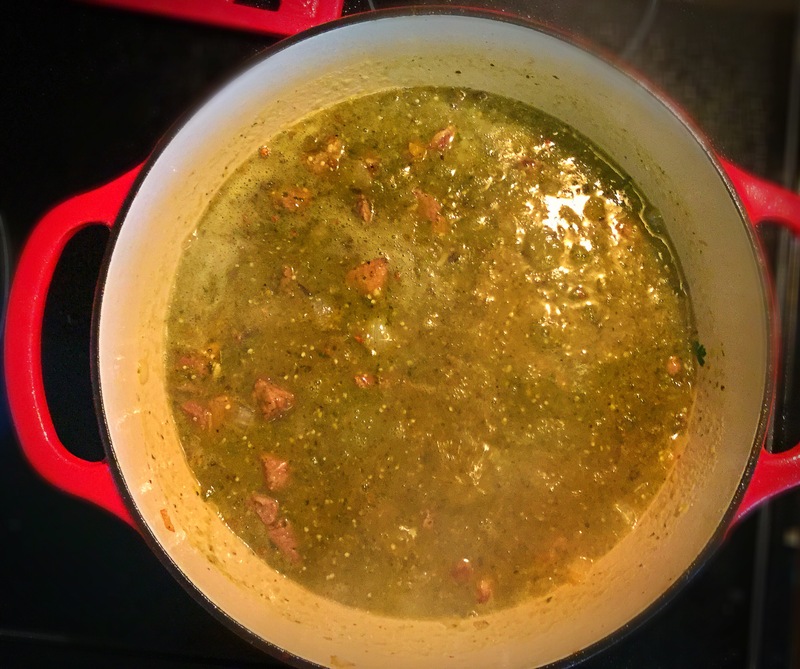 Next, add in the 2 cups of chicken stock and the mexican oregano. Stir. Bring to a boil, reduce to a simmer and cover. 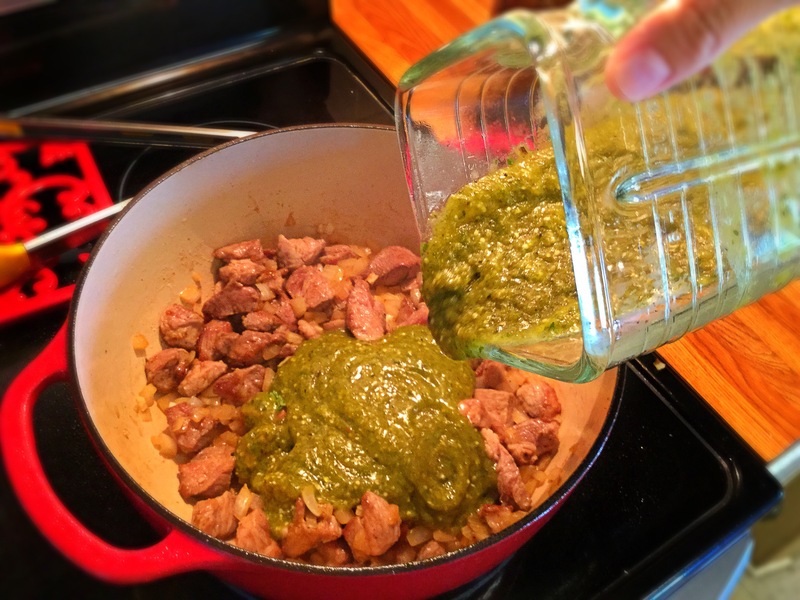 Let the Pork Chilé Verde simmer on low for at least 3 hours…the longer the better really!! 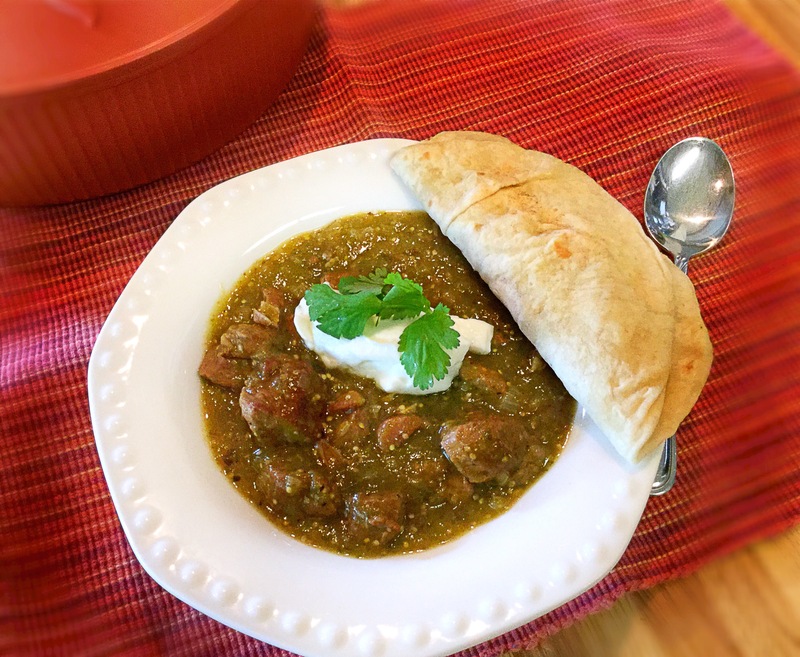 I like to serve ours with a dollop of sour cream, garnish of fresh cilantro and warm tortillas..enjoy! !